Recently in my Humanities class, we had an interesting project. The class is specifically focused on the history of women in the arts, and our midterm project was to create a self-portrait collage called “MyArtStory:” that describes ourselves as an artist. That was the full description of the requirements, and to interpret that as we saw fit. Some were literal self-portraits, with cut out bits of paper assembled as a face. Some were collages of people’s own artworks. I chose a more interpretive path: I took pictures of my own, and images from the web, and arranged them in a spiral to represent my life’s journey and the inspirations that have led to me getting into writing. 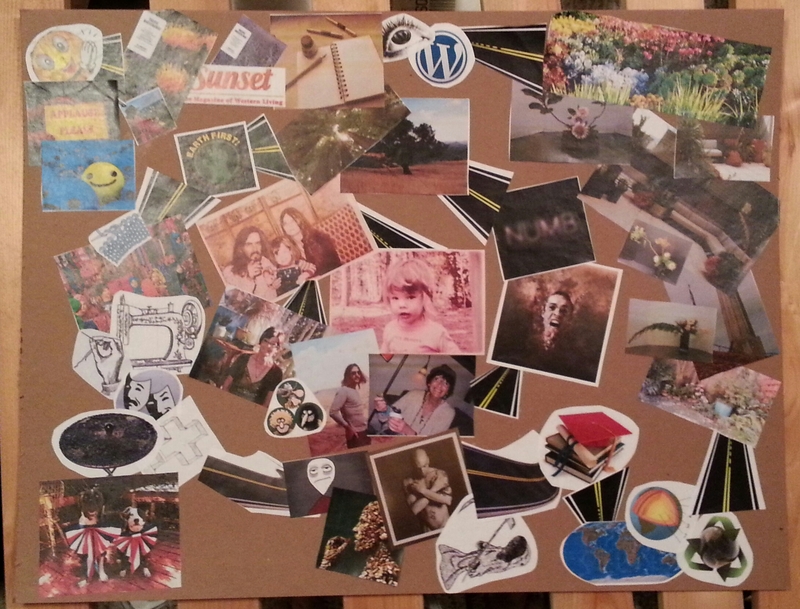 My self-portrait collage is about roads leading from then to now, from yesterday to today. It’s an abstract, yet somehow literal, self-portrait. It represents the journey of my life and inspirations, with roads spiraling outward. I have a connection to the spiral and the labyrinth as representations of life’s journey, and have several tattoos of both that represent my interest. In many spiritual traditions, a spiral symbolizes an emergence: a person’s life path is laid out before them, and the sojourner treads the ever-widening path from center outward. Turns that start as tight and difficult eventually broaden as experience eases the ways in which we contend with life’s challenges. Conversely, the spiral can represent a journey into the self, as one starts from the outer limit, from the point of today, and regresses through one’s past on a journey of self-discovery. Once in the center, the follower has the opportunity to reflect on the meanings of life’s events, and can then return to the present by coming back out along the spiral with a deeper understanding of how today’s inspirations came to pass. Starting at the center with a photo of myself as a young child, I follow through events of my life that have brought me to where I am today and have informed my art, using photographs of my own family and artistic expressions combined with representative found images. Parents, family, separation. Hippie childhood, schizophrenic mother, numbness to emotion as a coping mechanism. Self-discovery through love of nature and hiking, environmental activism. Theatre, sewing, knitting, craft. Drug abuse, death of a spouse. Rediscovery of self through nature and trees, love of ecology and Earth sciences. Formal education leading to gardening, design, happiness, and emergence into self-awareness. Ability to accept love again… Ultimately, writing is my most successfully expressive art form, of the many art forms I’ve practiced, culminating in publication and working on a memoir.